Sat/Sun Oct 9/10. The Roman Group will meet at the Teahouse, Northway, on these dates, 10 am-5pm each day. 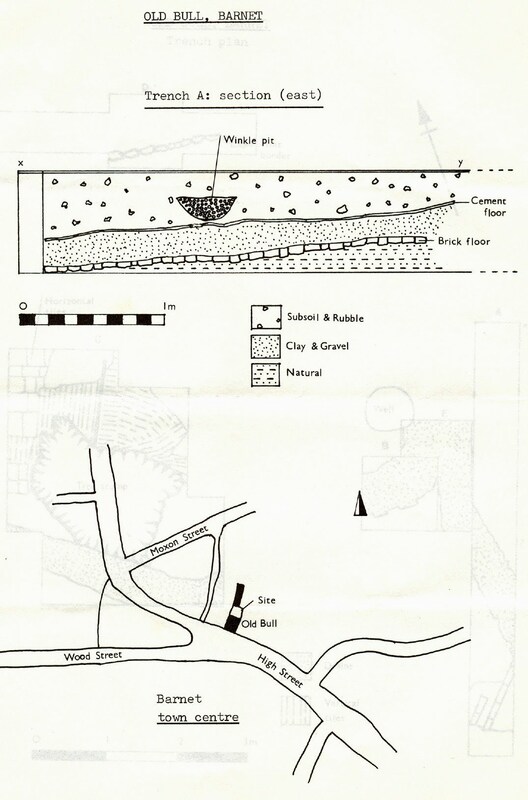 Object: to study in depth material from the early Brockley Hill digs and to continue process­ing field-walking finds. All HADAS members, whether experienced in handling Roman pottery or not, will be welcome. Bring a picnic lunch if you wish (there are facilities for making hot drinks). Please let Tessa Smith (958 9159) know if you intend coming. The Roman Group also plans a visit to Verulamium Museum in the fair­ly near future, details in the November Newsletter. Fri Oct 15. A meeting of the Prehistoric Group to discuss plans for the coming season will be held at 24 James Close, Woodlands, NW11 at 8 pm. All HADAS members interested in prehistory will be welcome. Ring Daphne Lorimer on 458 5671 after Sept 26 if you would like to come. Hon Oct 18. There will be a meeting of' members of the Documentary Group at 8 pm at 38 Temple Fortune Lane, NW11. It doesn't matter if you haven't got round to joining the group yet - new members are very welcome. With winter coming up, this is just the time to consider the pleasures of browsing in libraries and record offices - so come along and discuss any research projects you would like to start or help with. A call to Brigid Grafton Green (455 9040) will ensure a cup of coffee! Tues Oct 5 Opening of the lecture season at Central Library, The Burroughs, NW4 at 8 pm. Lily Goddard will speak on Coalhole Covers and Victorian Domestic Life (See Sept Newsletter for more details). Tues Nov 2 Anglo-Saxon England by Professor Henry Loyn, DLitt, FSA, FRHistS. Professor Loyn started his studies in English at University College, Cardiff, but later switched to history and subsequently became Professor in the History Department. While at Cardiff he was an exceptionally popular Dean of Students because of his warm and sym­pathetic personality. He is now Professor at Westfield College of London University. He is a leading expert on the Anglo-Saxon period for which he has an enthusiasm which stimulates his audience and sweeps it along with him. A strong sense of humour adds savour to his lectures and broadcasts, and we can look forward to a thoroughly entertaining evening. Mon Dec13. This date is earmarked for our Christmas do, but we can't give you details yet. Dorothy Newbury, having explored and dis­carded such ideas as Stationers Hall (largely because of prohibi­tive prices) is now onto what she thinks will be a good thing ­but we shall have to wait until November to tell you all about it. Meantime, please mark this date in your diary and keep it free. Sat Oct 23. At St Mary's Church House (top of Greyhound Hill, NW4 ­opposite Church Farm House Museum) 11.30 am-3 pm. Come and exchange your holiday news and gossip at our 21st birthday year Minimart. Coffee and ploughman's lunch available. HADAS and Shire publica­tions for sale. Home-made stall - jams, pickles, cakes and sweets. Offers of fresh fruit and vegetables also warmly received. Good-as-new men's, women's and children's clothing and household linens. Contributions can be brought to the October lecture or phone either Chris­tine Arnott (455 2751) or Dorothy-Newbury (203 0950) for alternative arrangements. Flint Arrowhead Manufacture. A series of experiments carried out for the Pitt Rivers Museum, Oxford, in 1944 investigated the tools and techniques of arrowhead manufacture. Quartzite hammerstones, antler tines and Brandon flint were used; a sequence of four stages of percussion and one of pressure-flaking was established. Tools and specimens have been de­posited in the Museum. Reference: Knowles, H S, The Manufacture of a Flint Arrowhead by Quartzite Hammerstone. Occasional Papers on Technology,No 1, Pitt Rivers Museum, Oxford, 1944. Reprinted 1968. Long-standing uncertainties over the operation of a hand-drill used by stonemasons in Egyptian tomb scenes have been settled by experiments on a functional reconstruction of the tool. The body of the device is inclined from the vertical when in use weights are loosely attached to it by straps and it continues upwards as an offset curved handle that is held at the top. The functional replica confirms that in a tool of this type muscular power is only expended in driving it by cranking in a horizontal plane, as predicted by a mathematical analysis of the mechanism. With practice, the lower end of the tool can be kept standing vertical, and deep vertical holes can he drilled rapidly, without undue exertion. This early application of the principle of hand-cranking can be dated to the 3rd millennium BC. Reference: Sleewyk, A W, 'Hand-cranking in Egyptian antiquity', History of Technology 1981, 23-37, London. Equally interesting experiments on cooking in animal skins, slash and burn experiments with old woodland at Butser, field trials of replicas of the standard 8-man papilio (tent) of the Roman legions and the making and use of a device for measuring distances by road, to specifications suggested by Vitruvius, are described. There is also a full report of an international working seminar on flint-knapping, with descriptions of non-structured knap-ins" by knapping enthusiasts from all over the world. If you want to investigate these goodies further, send an annual subscription of £1 to the Dept. of Adult Education, Southampton. This year's weekend trip, from Sept 9-12, was set in the wild and wind-swept countryside of North Northumberland. We started out on a bright Thursday morning (at what seemed like dawn), stopped for an early lunch at Hardwick Hall, Derbyshire, and after a surprisingly quick and trouble-free journey, reached the Cheviot Field Study Centre and Museum, Wooler, about 6 pm. Colin Burgess, due to be our guide for the next day's exploration, was there to meet us and although he found it impossible to guide us after all, he gave us an interesting background lecture on the prehistory of the area. We were joined by Joyce Roberts (our 'resident botanist' of the West Heath dig), now retired to live in Berwick. Led by Colin Burgess's colleague, Stephen Speak, we struggled valiant­ly uphill next morning in the teeth of a force-something gale to see a complete Bronze Age landscape preserved beneath the bracken and heather moorland, too high to be disturbed by more modern agriculture. At House-ledge we were shown clearance cairns, field boundaries, hut circles and burial cairns. The fit amongst us climbed to one hill-fort, Monday Clough; the super-fit also took in another, Humbleton Hill. We were blown back down to the coach and travelled to Roughting Linn to inspect the mysterious cup and ring marks on an outcrop of sandstone rock. Mr Speak doesn't believe in theories about their connection with ritual sacrifices of-virgins. The marks do seem to be linked with a cult of the dead, however, but it is unlikely now that we will ever know their real purpose. Some of us trekked through the bracken to the nearby hill-fort and climbed down the overgrown banks to a secluded waterfall under its defences. The day was crowned by a visit to an excavation in progress at Milfield, Roger Micket showed us around his two henge sites. We set off on Saturday for the city of Berwick, with a brief stop at Doddington to see a ruined bastle (fortified farmhouse). The museum of Border Warfare is small but modern. Its displays trace the complicated history of the region. The impressive walls are a survival of that turbu­lent past, constructed in the Tudor period so well that the city remains English. We split into three groups, each with a city guide, and were taken into a Georgian powder-store and a 'flanker' - a position on a bastion from which the defenders could fire along the walls', catching their opponents struggling in the moat in a hail of crossfire. Next stop was Lindisfarne. In beautiful sunshine we saw the Castle, adapted by Sir Edwin Lutyens from the originally Tudor fort for his friend, Edward Hudson, founder of "Country Life;" and the ruins of the Benedictine priory founded in 1081 on the site of the earlier monastery of Cuthbert. Refusing to be delayed by the delights of crab sandwiches and free samples of mead, we continued to Bamburgh Castle where again we went our separate ways: some to the castle, some to the Grace Darling Museum and some reprobates to beach and teashop. Our aim on Sunday was to see as many diverse sites as possible before our return that afternoon. We saw some unusually-shaped cup and ring marks at Fowberry, including a famous one said to be in the shape of an archer (or, alternatively, a Ford back axle). We visited Akeld Bastle, built in the 16c as a defence against raiders. The stone-built fortified farmhouse was an important structure in the Border-region: the stock were driven into the lower part of the building, the family retreated to the living area above, drawing up their wooden ladder behind them. Finally we walked for a rather long 'ten minutes' to Duddo stone circle in the middle of a potato field: a small circle of five stones, interesting because it is the only one in the area and the stones are deep­ly grooved. We finished with lunch at Heatherslaw Mill, in company with a hungry goat, before starting on the long journey home. So another successful trip has ended, leaving us with happy memories and an increased store of knowledge. Our thanks for a most enjoyable trip go to Dorothy Newbury, June Porges and Pete Griffiths for their organising exertions and also to Brian, our driver, who we hope we have converted to archaeology. I saw the remarks in the penultimate Newsletter concerning cupmarks and their interpretation. MUNDI (a history cartography journal) in which I have one of my current writings on this one aspect of all Old World rock art: 'The emergence of "maps" in European rock art: a prehistoric preoccupation with place.' It will be volume 34 (1982).. I would also refer your readers to Ronald Morris's excellently dis­passionate analysis of some 104 'explanations' of (British) rock art in Prehistoric Rock Art of Galloway and the Isle of Man (Blandford Press 1979). As far as the Northumbrian cupmarks go, I do not think a case can be made for their consideration as 'maps' of anything. I have yet to come across an assemblage of rock carved (or painted) motifs in Britain that compare with the possible 'topographical figures' of Valcamonica or Monte Bego (the latter in the Ligurian Alps). Any new findings would be welcome. PS A further, much more detailed, analysis of Old World rock art from the cartographic angle (and also dealing with the anti­quarian British literature) will appear in a year or two in ' Volume I History of Cartography (University of Chicago Press, Eds. J B Harley and D Woodward). *In this category were included the meeting places of, for instance, the Society of Friends, the Christian Scientists and others. The three main groups of Nonconformists are the Methodist, Baptist and United Reformed churches. They were formed many years ago by religious leaders who could not accept some parts of the dogma or discipline of the Established Church. These individuals were known as "Dissenters," as is reflected in the name of the Dissenters Burial Ground, in Totteridge. Of recent years church memberships have fallen, and sometimes this has caused financial problems. Some Nonconformist churches today "share" a minister. The smaller congregations of others (even of different denomination) have joined together. The United Reformed Church (formerly Congregational, in Brent Street, Hendon) transferred its congregation to the United Reformed church at The Hyde, Colindale. The Brent Street church was left empty and was later demolished, so that there are now new buildings where once this pleasant-looking church stood. The present survey has been confined to churches and meeting places of the three main groups mentioned above. An individual letter was sent to either the secretary or minister of each church, asking to see copies of any booklets that might have been issued in the past, particularly for special events such as jubilees or centenaries. Some helpful and encouraging replies resulted. In two cases the respective ministers came to see me, and one left a number of rare booklets for our Society archives. Many churches did in fact have the kind of booklets we were looking for, and it was possible to write a short history from them. The detailed nature of the information varied considerably; but it usually included facts about the founding of the church, its early buildings and later additions and developments. One disadvantage was that each booklet usually had a definite finishing point, which was not the present time there was usually a gap. This has been or, in some instances, still is being investigated by further correspondence. conformity, for which I am very grateful.The Local History Collection of LBB has also produced some relevant papers. On one important aspect of this survey I would be particularly glad to have the help of interested members. I had hoped to secure a complete set of photographs of all Nonconformist churches and their associated buildings, but so far I have not succeeded. I have only a very few prints I realise how large an area is covered by the Borough of Barnet, but I wonder if any members would be prepared to take photos of the churches in their immediate localities? In some instances it would be helpful to record the interiors, as well as the exteriors, and this would of course require appointments to be fixed. Anyone handy with a camera and ready to help is asked to phone me on 202 8441. I hope this gives some idea of the scope of the survey. A lot more work is still required. It would be interesting to extend the survey to the 23 churches included in "Other Centres of Religion," but for that I .need more help in the collection, writing up and typing of material - so even if you are not a cameraman, please make me an offer! You've got my phone number above, and my address is 53 Selborne Gardens, Hendon NW4 4SH. The London & Middlesex Archaeological Society will hold its 17th annual Local History Conference on Sat Nov 20 at the Museum of London. The programme opens officially at 2 pm, but local societies are always keen to exhibit at this lively occasion, and their displays may be in­spected from 12.30 pm. We need hardly say that there will be a HADAS display to inspect. Three talks are scheduled, all dealing with practical and interesting topics. Guildhall Librarian Mr R Hyde will discuss London parochial assessment maps and their uses; Dr Lynch will tell us about the history of the Great North Road through Middlesex, which should be of particular interest to our area; and Mr D J Gerhold will speak on how to get the best from Chancery and Exchequer records. Tickets (including tea) cost £1.50 and are obtainable from Mr J Slade, 20 Bendemeer Road,. Putney SW15 (enclose an sae). Our colleagues in the NW London branch of the Historical Association invite us to a lecture on January 20 next at 8 pm. Mr John Fisher will speak, with colour slides, on the excavation and raising of the Mary Rose. The venue is Lower Skeel Hall, Westfield College, Kidderpore Gardens, NW3. HADAS Members will be very welcome, and we are given this further information about how to get there: "the entrance to the hall is by a short passageway near a pillar box, and then through a heavy door on the right hand side." The Old Bull Arts Centre was planning to build a new theatre at the back; HADAS was given a month to dig the site before work began. There was good reason to suspect that it would be worthwhile. Situated in the centre of the oldest part of Chipping Barnet, close to the medieval church, Tudor college and early domestic buildings, the Old Bull was on a spot that had almost certainly been occupied for centuries. The local library has a curious postcard on display. It shows what is described as "a plain glazed clay Roman (sic) jug about 14" high and in perfect state of preservation, found in a bricked-up Roman well under the former premises of J A Clark & Sons Ltd, when the building was extended in about 1931. A Roman wall was also discovered which ran from under the premises diagonally across the Bull yard.."
It is not clear who identified the well and wall, but according to B R Leftwich the jug was dated by the British Museum as between AD 500-600. There seemed to be a fair chance that the dig would pick up this wall, and possibly other evidence of Saxon occupation. At the time of preparing this report some potentially useful documents are inaccessible in Barnet Museum but from what is available it is ob­vious that the Bull was one of a string of ale houses and inns fronting the High Street from early times. An early reference to it occurs in a transaction dated 1553 that mentions several identifiable inns including "La Bulle"2. By the 18c a picture emerges of a rather rough establishment. The 1749 vestry accounts record a payment of 9s6d for a "coffin and shrowd" for a man who drank himself to death on gin at the Bull. In 1787 "3 one William Hoskin who had been invalided with wounds out of the Guards complained that Michael Walsh, the landlord of the Bull, had assaulted him and flung him out, after which he was assaulted by 'several fishermen' who kicked and carried him into Market House ... Here they forcibly took away his tin box in which were his discharge papers and a guinea and a half, and his clothing was stolen from his bundle. "4 In the same year a manorial survey5 described the property as "a good house called the Bull Inn, with a yard, stabling and garden, being in the whole 1½ acres of ground." The earliest large-scale map - a manorial map of 1817 - indicates the "Black Bull" on the site of the present Old Bull. A tithe map of 1840 is clearer, and shows no structure on the area at the back of the Old Bull where the excavation took place. Most detail, however, can be seen in the 1876 Ordnance Survey 25" map, which shows garden features over moat of the site. The present Old Bull building is probably no earlier than 18c, with a 20c glazed-brick facade, and a rear brick extension probably dating from the turn of this century. (This extension has since been demolished). The Old Bull ceased to be a pub sometime after the war, and has been used as a community arts centre since then. 5A survey and valuation of all the copyhold estates of the Manor of Chipping Barnet and East Barnet, made by Messrs Kent, Claridge & Pearce 1787. Herts County Record Office. out, the latter proved not to be a problem. This was the foundation trench for the east wall of the theatre, and was 6m long and 65cm wide. Lying at the lowest part of the site - ground level was close to the architect's datum - it promised the greatest opportunity of a section across the site as well as a chance to get to deeper levels. Beneath a thin concrete surface covering was a loamy, rubble-filled soil containing some white glazed china, bone and other 19/20c artefacts. At a depth of 20cm a tightly packed mass of winkle shells was found - possibly the reject stock of a stallholder. 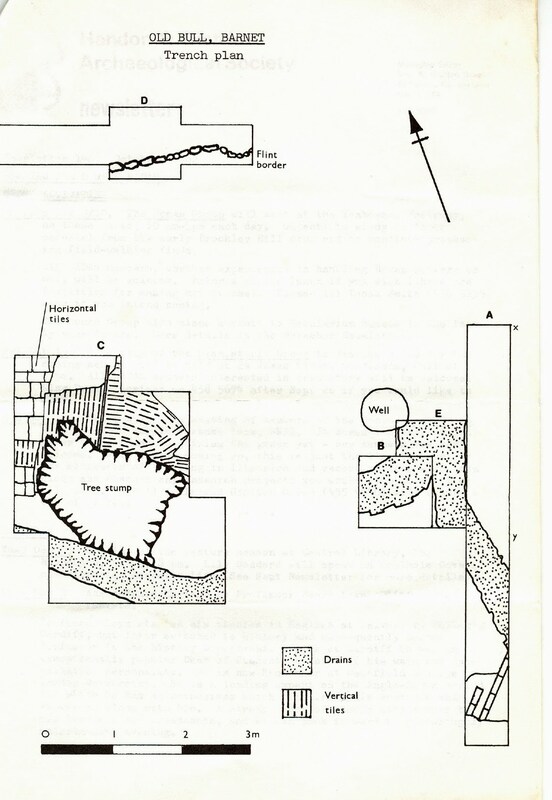 The winkle pit was resting on a sloping, sandy-cement floor (see section drawing) that extended over the northern half of the trench. The southern end was-largely occupied by a still functioning soil pipe from the Old Bull. This pipe was encased in a brick channel, bedded on flint cobbles, and capped with concrete. It was clearly contemporary with the rear extension of the Old Bull. This drain crossed the trench diagonally, apparently cutting through an earlier brick gulley. The sandy-cement floor was bedded in a layer of clay and pebbles, which in turn was deposited on an irregularly laid soft redbrick floor. This was lifted to reveal what appeared to be natural. Though this was at the maximum permitted depth of the trench, it strongly resembled what was positively identified as natural elsewhere on the site. All layers contained recognizable 19c finds (some were under the redbrick floor), though some earlier finds. also came to light. These in­cluded a 17c clay pipe bowl, two small rim sections of Metropolitan slip-ware, dating from late 16c, and a piece of bone comb of 17/18c origin. This was a 1m square trench, designed for the foundation of a pillar. It also contained a similar glazed soil pipe, still in use. What little room was left consisted of a rubble fill, containing some finds including a reckoning counter. Because the two soil pipes appeared to join under the baulk, the trench was extended slightly northwards and eastwards. This extension was named Trench E.
Because the tree stump had to be removed we were allowed to excavate an area immediately round its roots to a depth necessary to extract them. This gave rather more scope than the narrow confines of the foundation trenches. The trench began as a 2m square but was steadily enlarged. For the first 50cm the soil surrounding the stump was highly dis­turbed, and contained large quantities of broken roof tile, glazed 19c china and pottery (little of it from the same vessel), the necks of wine bottles, bone and clay pipe. Among the finds was a small sherd of partly-glazed pottery, identified as a piece of a chafing dish, possibly late 16c in origin. (These dishes were filled with charcoal and were used for keeping food warm). In the northern end of the trench, at a depth of 54cm, a floor ­or more probably a pathway - was found. This consisted of an area of broken peg roof tiles set neatly and symmetrically on edge (and partly covered with a thin burnt layer). These vertical tiles alternated with smaller areas of the same tiles laid flat. The pathway appeared to have been constructed to accommodate the trunk of the tree when it was much younger (though later roots had grown across it). The tiles were lifted, and beneath some of them was a disturbed layer containing white glazed china, willow pattern and other 19c arte­facts. But the majority of the tiles had been placed directly on top of an identical lower layer of vertical tiles. In the north western part of the trench these lower tiles were laid in the same direction. In the eastern part they were grouped in a more random way. This lower pathway was bedded in a thin layer of clay, which contained no dating evidence. It, in turn, rested on natural - confirmed by a deep pilot hole. However, on top of the natural, seven small body sherds of coarse pottery were found. These were identified as South Herts grey ware, dating from the 13/14c. The north wall of the theatre was to include, another 1m square pillar and this formed the starting point of the trench. Beneath the thick concrete floor of the recently demolished shed was a layer of loose rubble, containing large quantities of recent artefacts, including a newspaper dated April 1, 1950. This rested on a worn, symmetrically laid, soft redbrick floor at the same depth as a similar layer of bricks found by the contractors in the north west corner of the site and clearly part of the same floor. To investigate this further, part of the north wall foundation trench was opened. Though the floor petered out to the east (where it was much disturbed), it continued to the west where it was coated with a thick deposit of coal dust. From a pipe trench dug by the contractors it was possible to confirm that this was simply an older floor of the shed. In the 1m square part of the trench the floor was lifted. This showed that it had been laid partly on an area of brick/yellowy mortar/ tile fill, partly on soft humus like earth bordered by large flint nodules (30cm below datum). The latter was almost certainly a former flower bed. The flints were bedded in the same fill as the rest of the trench and continued downward to a depth of 90cm below datum. At this point a dark brown layer of pebbles (some of them large), tile fragments and some signs of burning were visible. Between 5-10cm below this the evidence of dis­turbance lessened, the pebbles became lighter in colour and natural began to appear. Though this was at the maximum permitted depth, it corresponded to the depth at which natural was found elsewhere. The tile areas in Trench C strongly suggest the work of a 19c garden­er and it appears as if they were laid out at the same time the chestnut was planted. The 1876 OS 25" map even shows a garden feature that could be a pathway in that area. The roof tiles, which had been used, may have originally come from the Bull though adjoining buildings have early clay-tiled roofs, the Bull has later slates.The dig clearly showed that the ground level in the second half of the 19c was lower than at present, and must have been made up since then, probably when the rear extension of the Bull was built. The fact that this made-up ground contained some artefacts earlier than the 19c is obviously not significant. Harder to explain is the fact that natural was reached immediately beneath this 19c level right across the site. Even if this area behind the Bull had always been a garden, it would inevitably have accumulated a large quantity of domestic rubbish from the pre-Victorian period. The only conclusion must be that when the 19c garden was laid out, the site was landscaped and lowered, and the remains of earlier centuries stripped and dumped. The few medieval sherds in trench C must have escaped this levelling. Because the Bull is on the summit of a steep hill, it is perhaps not surprising that ground levels have been much altered in the past. HADAS members who took part or helped, particularly Howard Hesp Alec Gouldsmith, Audrey Hooson, Ann Trewick and Eric and Ella Ward.